The alarm woke me up with a start again, not the normal during the week alarm for work, this is the much more pleasantly sounding Saturday Mustang Maniac alarm which don’t give the hump when I hear it. I struggled to wake as the air was already muggy and hot. I eventually got in the car and set off, already the air outside was hot and the aircon was on. I arrived to see Yogi in the forklift moving tool boxes about and having a brutal clear out of his old work shop. Adam was opening up the workshop where my car was and I handed over the standard payment of the cakes, these were taken straight to the boys club for an early morning cup of tea and doughnuts. The discussion was had about my tasks of the day. We decided carpet and lettering on the hood. I was given the keys to Adam’s lock up where the carpets and cushions are stored and he simply said “pick your colour of carpet”. For some strange reason I felt like a little kid on the way to a sweet shop with a pocket full of change to spend. There was about thirty boxes of carpet to choose from, years and body style to their variations of colour. The colour I picked was “Ford Blue” and it just happened to be at the bottom of the pile! 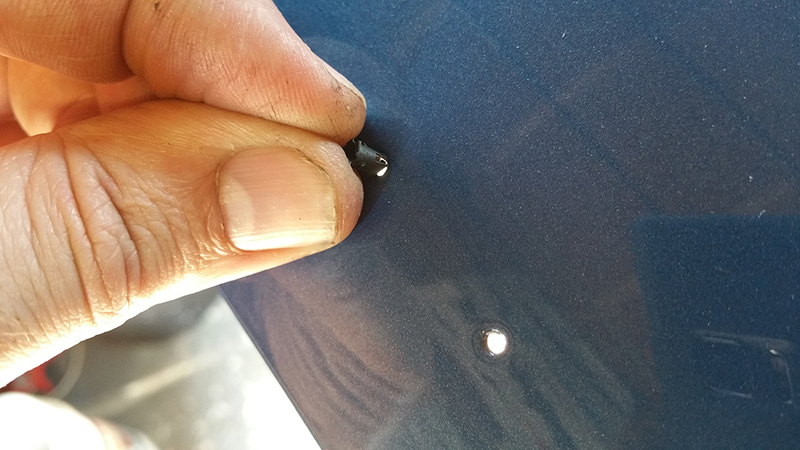 I cleaned the car from all the old bits of wire and dirt that had accumulated in the grooves of the Dyna-Mat. The rolled up carpet was pulled out of the box and laid straight into the car. I unrolled the carpet which was in two parts. The rear and front which has the nicer finished edge. 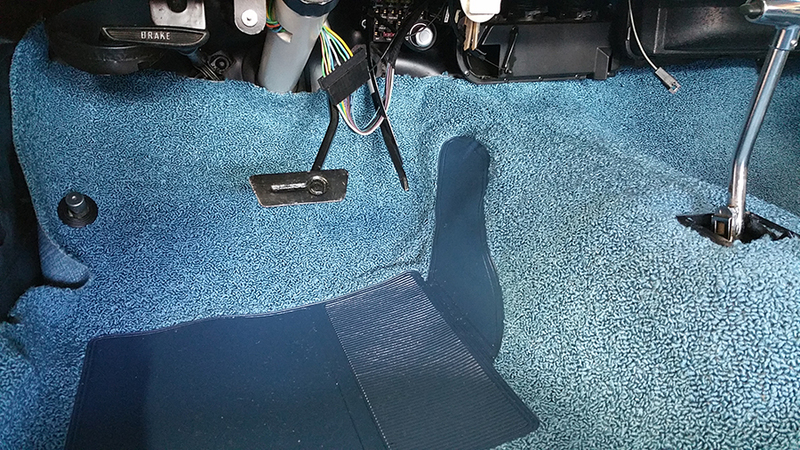 The carpets have a sound deadening material on the back which sits in the footwells both front and back. Unroll the carpet and press into the footwells. 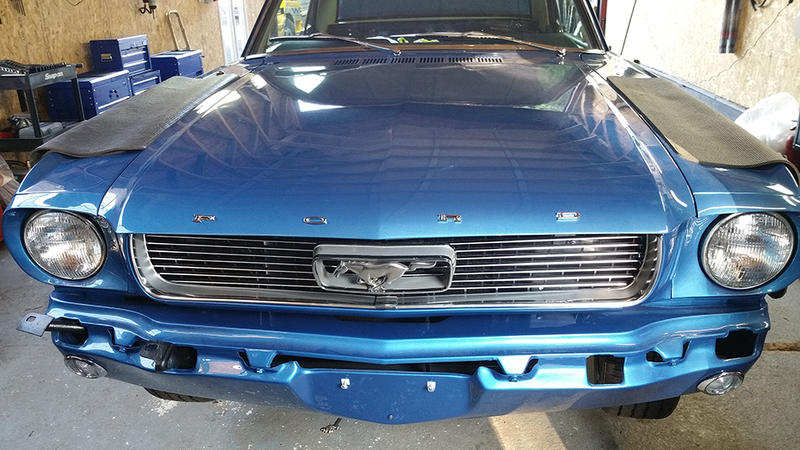 The front section was a little different and required some minor modifications due to the carpet being Fastback and Coupe and manual and auto gearboxes. The main difference was the way the carpet fitted around the gear selector. this had to have about an inch cut away at the front. Once done it was easily pressed into place around the selector. 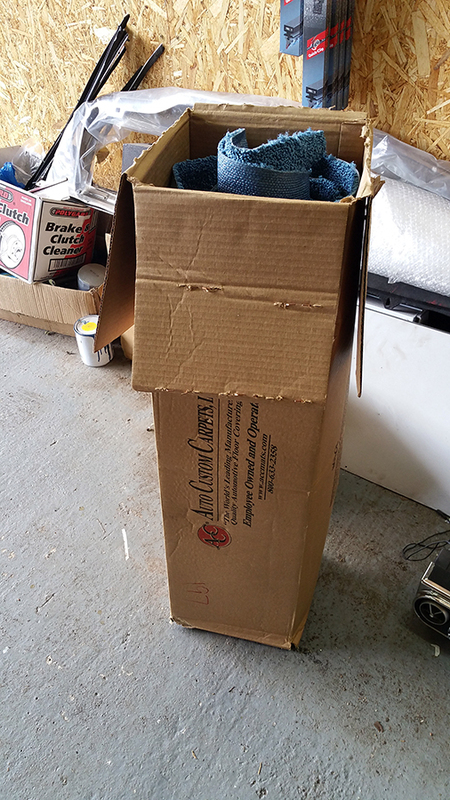 There was a rubber grommet inside the box which has be cut out for the foot operated headlight dip switch. The back of the carpet has a cut out for position. You cut the hole and press fit the grommet into place. Make sure the carpet is in the correct position where you expect the switch to be mounted before cutting. This wasn’t so important for me as I had the multiple attempted holes all patched and I made two new ones where I wanted them. Lay the front part of the carpet over the rear section and your pretty much done apart from making the holes for the seat studs to be fitted. Yes there will be some trimming around the edges a little later but the MM guys advise to leave the carpet to settle for a week or so first. The front kick panels will hold the carpet in place and keep it neat. The next part I was looking forward to and at the same time, very nervous about. 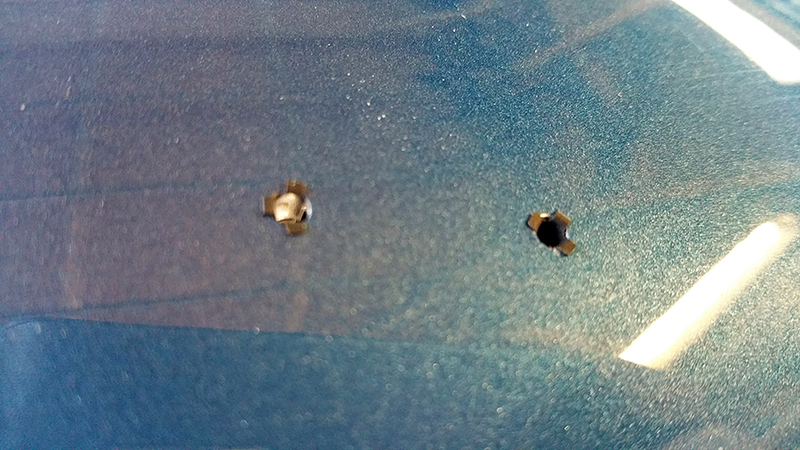 The hood already has the holes drilled out ready for the letters. The letters have two prongs on the back of each letter and is held in place by two tiny grippers only a couple of millimetres long and are sprung fit into the hood holes. The grippers were test fitted into the holes but there was no way they were going to fit. I had to get a sharp Snap-On rat tailed file and oh so carefully remove the excess paint from the holes to fit the grippers in the holes. One slip here and I could have gone across my gorgeous paint work. Needless to say this took me quite a while to do all eight holes. With the holes opened just enough I lightly pressed the grippers in and tapped them down with a rubber part of my pliers. (Shh, don’t tell Snap On that bit). They were curved enough and not to heavy to lightly tap the grips down. The letters were next aligned to the holes make sure the legs on the back of the letters would fit. Once you are happy press fully home. At this point you need to make sure you can spell “F O R D”. In actual fact this is a bit of a myth, as the letters all have slightly different places for the holes and can only fit in the right place on the hood. There was another optional extra at the time that I wanted to have fitted to the hood, this was the leading edge trim. The trim just gives the grill the extra edge finishing touch. 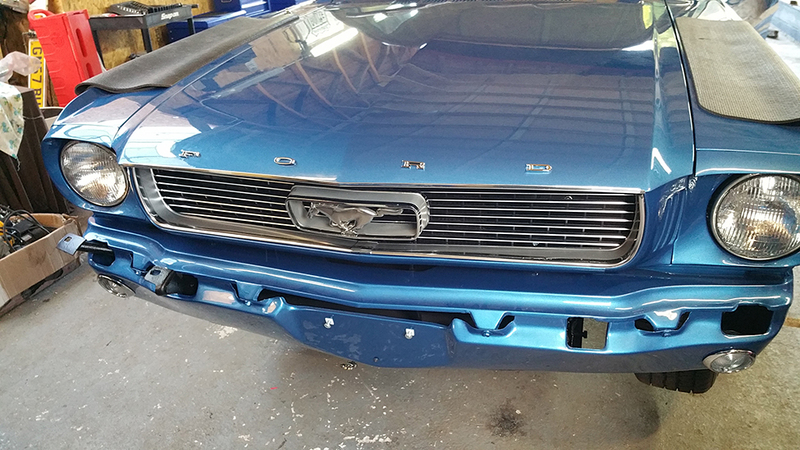 The trim is held on by a few screws under the hood and makes quite a difference. Next week I think it will be the radio and the splash guards. I just can’t wait till next weekend already! This entry was posted in Car, Photo's and tagged carpet, ford, Mustang, Mustang Maniac, One man and his Mustang, paint, trim. Bookmark the permalink. I wasn’t aware of any issues, but I do know wordpress has a habit of breaking stuff. Is it just Nokia or Android & apple too. My Note Edge seems to view stuff ok, I think. Anybody else have issues? I could mention it to wordpress. Thanks for letting me know though. I continue to really like to color!!! Lol, Thanks Timothy. I was worried about a big gouge where I slipped with the file, I could of ended up with F Q R D instead if I wasn’t careful. The would be quite quacky if you got a Q in it. It would be something different I guess. I wouldn’t like to try and pronounce it though. Unless I had a couple to many of course. It’s been a long lng day. Lol. Your project is coming along quite nicely…enjoy the updates. I was amlost sure that was your car in the new workshop :). Those rugs look so soft that makes you want to drive bare foot.